society. As a result of demand, brands are desperately trying to stand out on the market, from vicious competition, to make people chose them over the festive period. At Steve Wood Services we’d recommend using popular or widespread events, such as Christmas, as opportunities to market your business in a new way. Here are some of the top Christmas branding materials to give you some ideas. Working Christmas shapes into your marketing materials is a really simple but effective way of branding. Adding another layer to your materials with certain easy-to-spot shapes will grab the attention of the public, making the brand stick in the mind and increase the chances of sales. Many companies have used this in the past such as Quality Street with their reindeer head made from chocolates, a Christmas tree of McDonalds’ fries, and other festive shapes made from Apple headphones. In a similar way to using shapes, outlines or stencils, business’ can be clever with their Christmas marketing material by directly relating it back to their brand. As an extension of before, shapes and words can go hand-in-hand with what your company offers to really create a clear and strong design. Not only forming the shape of a Christmas tree in their design, Heineken play on their brand by using a nutcracker instead of a bottle opener for their beer top. 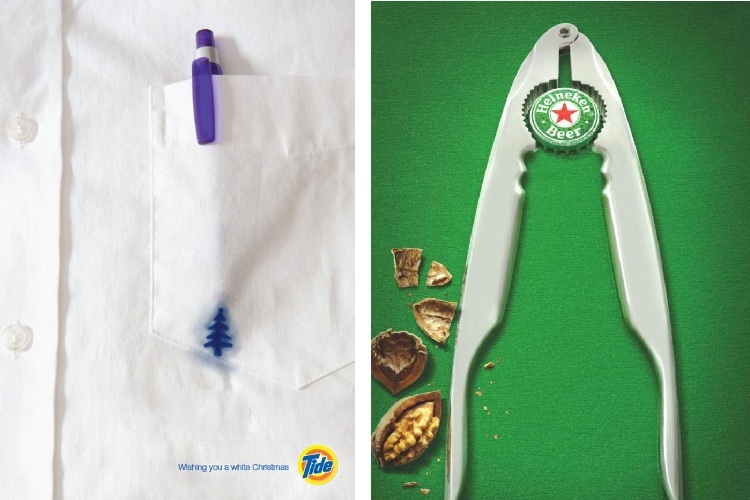 Another example is from Detergent company Tide who cite ‘Wishing you a white Christmas’ alongside a pen stain shaped as a Christmas tree. Businesses are getting more aware to the fact that using vintage looking branding can be particularly striking, especially in a market thriving from modern, digital technology. 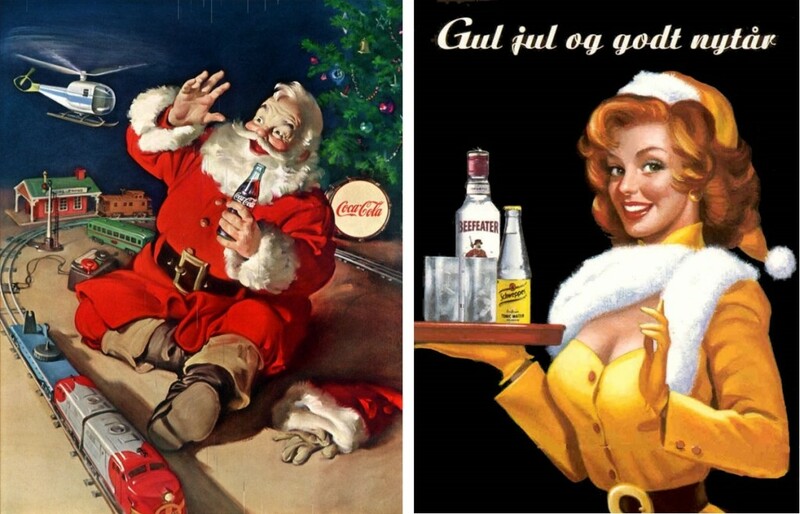 Where would we be without the classic Coca Cola ads? Other beverages and sweets also use this. Stepping away from computer-designed imagery is a really forward-thinking tool to use the best of old and new. Non-photographical or digital materials will stand apart from other designs, and shows a genuine thought for the festive period. Attention to detail is key when it comes to marketing and what better what to develop detail than by working illustrations into your design. 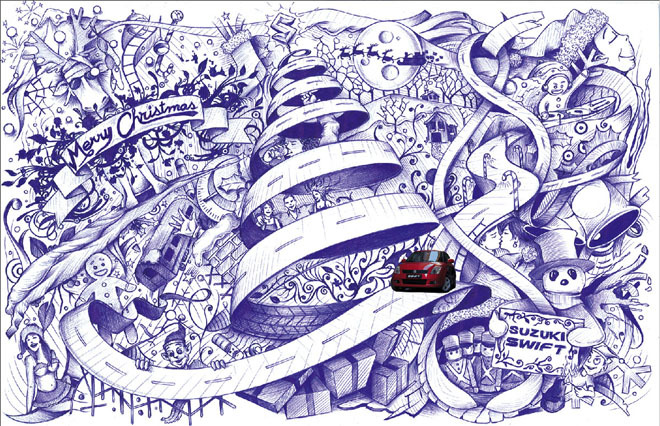 The biro-ink style of the Suzuki Christmas advert is brimming with festive imagery and numerous symbols, whilst still relating back to the car brand. Perhaps the most costly and tricky of marketing designs to pull off, illustration definitely works well to promote a brand but only when used appropriately and relevantly. If you need printing and ink products or services, we can help at Steve Wood Services. With a range of colours and varieties there will be something to fit your needs. Simply get in touch to let us know what you’re looking for. Find more branding and printing tips on our blog. We wish you all a Merry Christmas!